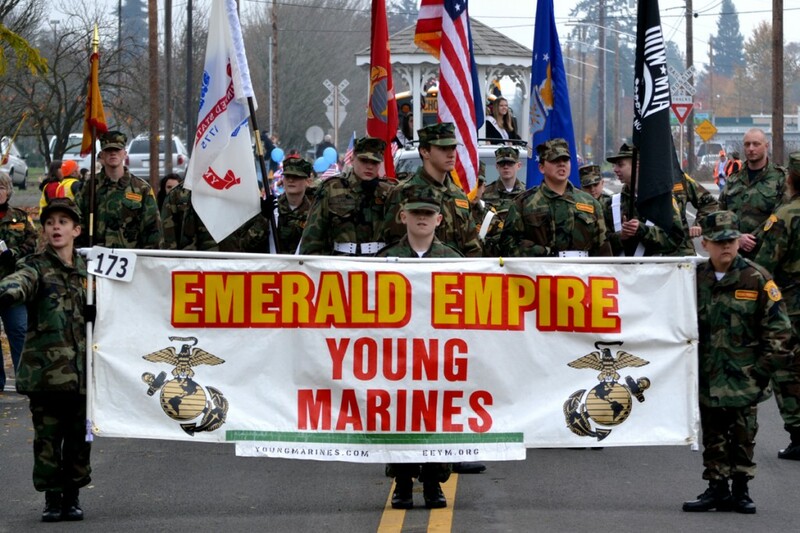 November 11, 2013, the Emerald Empire Young Marines marched in the Springfield Veterans Day parade. On November 12th, EEYM marched in the Albany Veterans Day parade. On both days it was an honor to see the many active or retired military veterans that participated in the parades, including those that served during WWII. At both the Albany and Springfield parades entrants included youth organizations such as the Emerald Empire and Lynn – Benton Young Marines, Lebanon High School ROTC, Willamette Leadership Academy, Springfield, Thurston, Albany and other school bands; Boy Scouts, Cub Scouts and Girl Scouts and several other youth groups. Also honoring our vets were many adult and family organizations and groups such as fire departments, motorcycle and car clubs, equestrian groups, military associations, families and businesses. What a great opportunity Veterans Day along with it’s parades is for each of us to reflect upon and show our appreciation for those, that have served and continue to serve our country so honorably. Never let us forget the many men and women that have sacrificed life and body so that we have the opportunity to live in a free United States of America.